Time to master iOS 7! Jump over to this quick guide to let you have ideal control over your iPhone and iPad running iOS 7. With great new features comes quite a bunch of new stuff to learn. In iOS 7, a lot has changed. There are countless new features and options to play with. While this doesn’t serve as a comprehensive how-to guide (we’ve got a whole lot of iOS 7 how-tos), from (simple things like) closing apps to changing backgrounds correctly. In iOS 6, you used to tap on an icon in the multi-task-switcher and then tap on the “-” icon. In iOS 7, all it takes to close an app is a swipe-up. Swipe up on an app screen to close that app. You can also use the three-finger swipe to close multiple apps at once. As usual, there are several iMessage “Waiting for Activation” errors right now thanks to all the server load. You might want to try a few things to fix it. Safari can now store and auto-fill passwords and credit card information whenever you’re set to type these in websites. While some people might be paranoid to store credit card data on their iPhones, for those who routinely need to type their CC information, this feature should be useful. If you used Spotlight on iOS 6, you probably miss it now. Apple actually wrapped it up into a gesture-triggered feature instead of having it on a separate page. Lifehacker put this simple gesture-sheet. To open Spotlight Search, swipe down from the middle of any home screen. 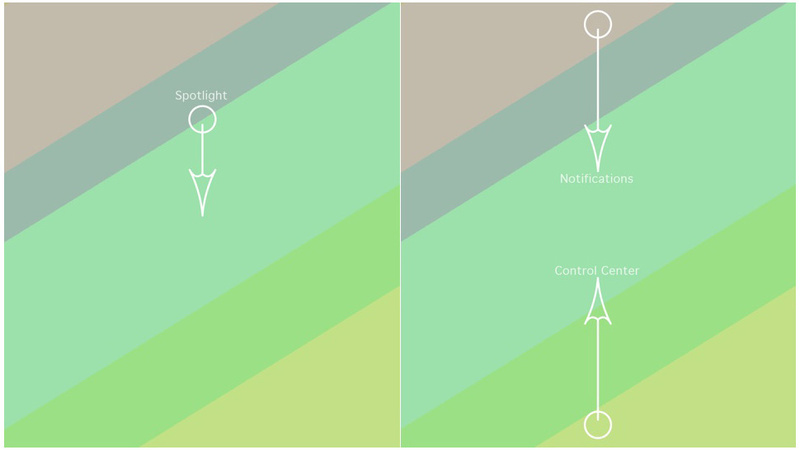 Apple’s redesigned iOS 7 offers a new Notification Center: it is segmented into three tabs. The first tab, which shows by default, shows “Today” which is a synopsis of events, reminders, and weather for today. Tap on “All, “ and you see all the notifications that you got. As such, this is the new weather widget, and you’ll have to make do with this. Apple has debuted parallax wallpapers in iOS 7. If you’re concerned about battery issues, turning it off can extend the battery life of your device. Check out how to turn off the parallax effect in iOS 7. But another interesting aspect of this feature is that when you put a background wallpaper, chances are it gets zoomed in. This is done by iOS 7 so that it has “room” to enable the parallax effect. To turn this off, you just turn off parallax (Reduce Motion). A side note here: we’ve not tested it on all devices so if you find that this doesn’t work, let us know. Control Center is the coolest new things Apple’s proud of, but when you’re playing a game where swipe-from-screen-bottom is a gesture, things can go awry easily. This is because the Control Center is opened when you swipe from the bottom of the screen. The only way out is to disable the Control Center when you are within an app. iOS 7 is a damn good multitasker now. It can update apps running in the background automatically so when you open it again, it has the latest information. This comes in handy when you’ve got apps like Facebook, Stock, Weather, Twitter, etc. running in the background. But one downside is that it can use up battery. A lot. Disabling it is easy and as far as I’ve seen, has no significant change in the way you use apps. This is a feature that has a 50/50 chance of being a favorite of any random iOS 7 users. Some people like their apps updated automatically and some like to have that control over updating apps. If you want to disable auto app updates – this helps you save on data and battery – you just toggle a switch in “iTTunes & App Stores” under Settings. Here’s a tutorial on disabling auto app-updates. iOS 7 is considered to be a giant leap for iPhone and iPad. With the brand new design and a host of immensely user-friendly features, the latest iOS ecosystem is readied to let you make the most of your device. To know more about it, head over to this post.